Rebecca Coales, trained by Steve Millard of the freedivers.co.uk group, managed to extend her own record from 120 metres to 134 metres distance underwater swimming doing just breast stroke. The total dive time took 2 minutes and 52 seconds at the Huddersfield Stadium health and fitness complex run by Kirklees leisure kirkleesactive.co.uk/stadium on Sunday the 17th November. It was overseen by internationally qualified judges from the main Freediving agency, AIDA International. A number of athletes from around the UK came to Huddersfield compete in one of three disciplines. Dynamic apnea with Fins (DYN), which is swimming horizontally, as far as one can, wearing a single mono-fin or bi-fins. Dynamic no fins (DNF), swimming as far horizontally as one can with breast stroke. And static apnea (STA), lying stationary holding your breath for as long as you can. Each discipline has a point score, the highest point score wins, simple. We also have depth disciplines but this competition just concentrated on the pool. Other note-able results were a 152 metre swim from Bart Lubecki of our Liverpool club using a mono-fin. Masa Sorn took the overall second place turning at 150 metres, also mono-fin propelled. 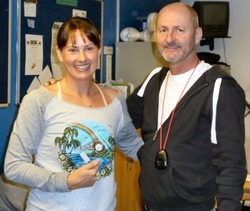 And 5 minute 10 second breath hold from relative newcomer Jason Amson-Orth, and a 4 minute 46 second breath hold from Deb Gaskell, who only started freediving in the last few months. Contact us, and come and join us for training, recreational diving or competition.